Today, I made a birthday cake for all the September Babies in my life! 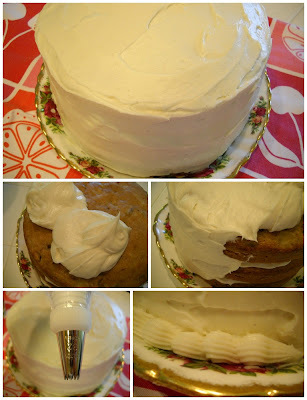 My version of an old Southern favorite the Hummingbird Cake. If you've never had this cake, you really should try it. It's easy to make, real comfort food and super delish. 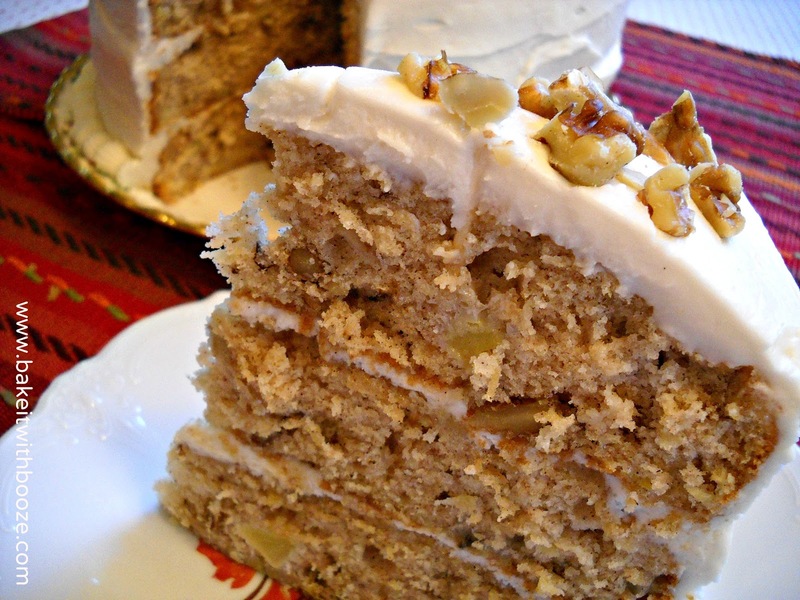 This cake really holds up to frosting and the cake is moist (bananas and pineapple) and full of flavor (cinnamon and rum). (Carrot cake - carrots) + bananas = YUM! This recipe is adapted from a cookbook by Art Smith, who was Oprah's chef...As we all know, I'm not a fan of Oprah (that would take a few blogs to explain...), but hey, regardless this-guy-can-cook! Pull your ingredients together and drain the pineapple, reserve the liquid in case you need it later. 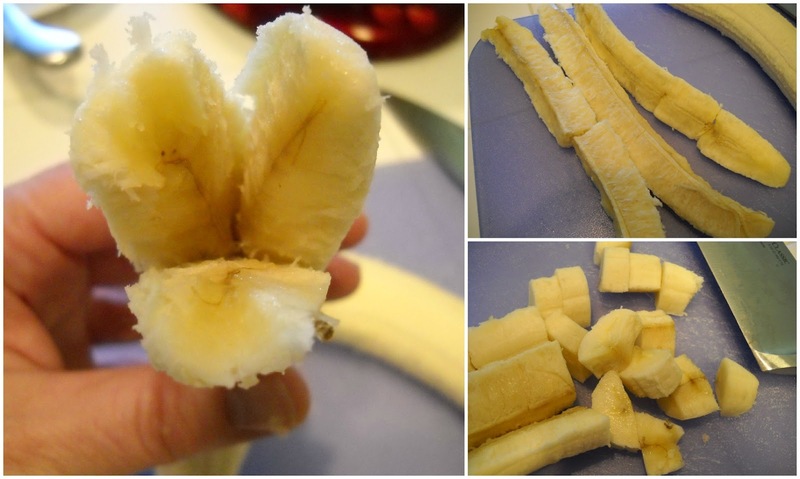 Section the bananas by running your thumb down the center to separate the three sections. Cut into large dice. Place the bananas in a bowl with the pineapple. 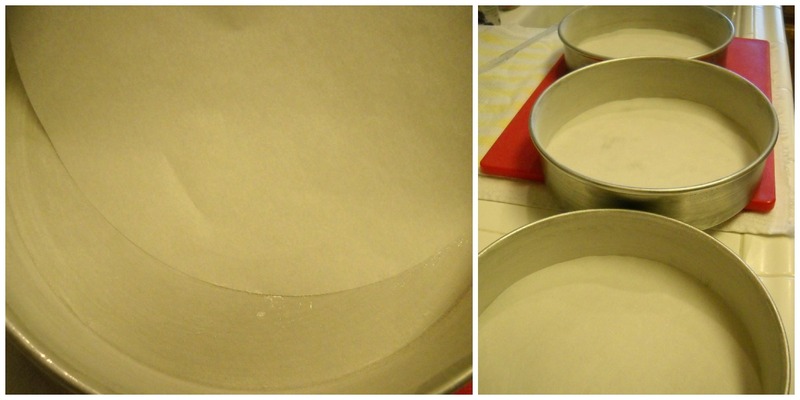 Grease and flour 3-8” cake pans (2” sides) or 2-9” cake pans. Weird photo...sorry. I wanted to show how to do this. I was baking with a young baker this spring and he didn't know how to do this step. 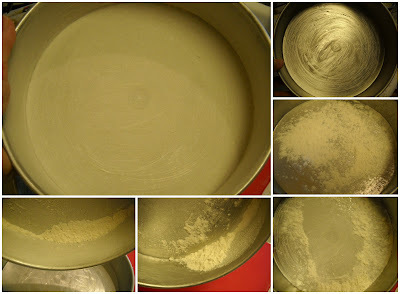 Grease, sprinkle some flour, shake it around the bottom, tilt the flour around the rim, turn like a steering wheel until all the surfaces are covered, then dump the excess into the next pan. Easy, peasy. Sift your dry ingredients into a bowl and set aside. 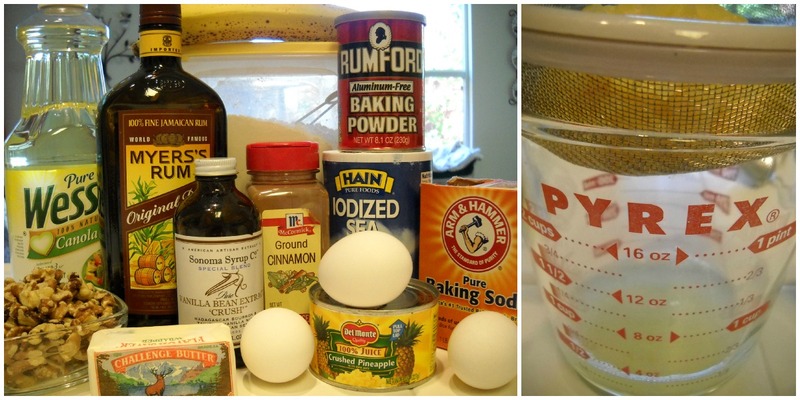 In a stand mixer, beat the butter and sugar until combined. Add the oil and mix. Add the eggs, one at a time. Then the vanilla. On low speed, add flour mixture alternating with the rum. Mix until just combined, do not over beat. This step can be done all by hand. [Note: if the batter seems too dry, add some of the reserved pineapple liquid.] Fold in the bananas, drained pineapple and walnuts. Spread evenly in the pans. Bake as directed, checking at the 35 minute mark and every 2 minutes there after. 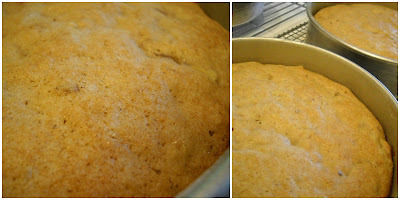 Cool on a rack for 15-20 minutes; this is longer than most recipes and I find it's better as the cake has more time to cool and set. Remove from the pans; let cool completely. Place one cake on a cake plate. Cover with about 1/2 to 2/3 cup frosting. Repeat with the next layer. Then, finish frosting the sides and top of the cake. Sprinkle the top with more chopped walnuts, or add sprinkles or candles! Remember: this is a birthday cake after all! 1. Grease and flour 3-8” cake pans (2” sides) or 2-9” cake pans. Line each with parchment paper. Set aside. Preheat oven to 350F. 2. Sift flour, sugar, baking soda, cinnamon, and salt into the bowl. Set aside. 3. In a stand mixer, beat the sugar and butter until fluffy. Add the oil and mix. Add the eggs, one at time, beat well. Then add the vanilla. 5. By hand, fold in the bananas, drained pineapple and walnuts. Spread evenly in the pans. 6. Bake for 35-45 minutes (longer for 9” pans) until the cakes spring back when pressed and a toothpick comes out with a few crumbs. 7. Remove the pans to a cooling rack and let cool for 15-20 minutes. Remove the cake from the pans and let cool completely on the racks. 1. In a stand mixture, beat the cream cheese, butter, vanilla and rum on medium speed for 30 seconds to combine. 2. On low speed, gradually add the confectioners’ sugar. Once combined, beat on medium-high for 30 seconds, careful not to over beat or the frosting will get too hot. 1. Remove the parchment from each cake. Place one cake on a cake plate. Cover with about 1/2 to 2/3 cup frosting. Repeat with the next layer. Use wood skewers to stabalize the layers if necessary. 2. Spread the remaining frosting on the top and sides of the cake. Start with the sides. 3. Sprinkle the top with more chopped walnuts, if desired. 4. Refrigerate until the frosting is set. Can be wrapped in plastic wrap once the frosting is set. Note: I placed a bit of the frosting in a small pastry bag with a scallop tip and iced around the edge. This adds a more finished look to the cake. This cake is best if made one day ahead. P.S. Okay, so I really changed Art's recipe...I didn't use the whole cup of oil and combined it with butter. I liked this crumb better than an all oil cake. That is a happy Hummingbird Cake--I know my September birthday hubby would love it. You've outdone yourself with creativity and I think you should rename it Rummybird Cake! Banana cake rocks. Especially with rum!